Glycerol Assays | Cell Biolabs, Inc. Cell Biolabs’ Free Glycerol Assay Kits measure free, endogenous glycerol by a coupled enzymatic reaction system. The glycerol is phosphorylated and oxidized, producing hydrogen peroxide which reacts with the kit’s probe. 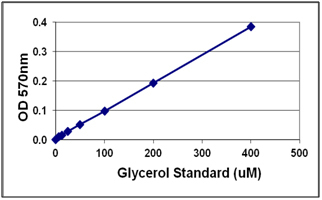 Figure 1: Standard Curve Generated with the Free Glycerol Assay Kit (Colorimetric). Desarzens, S. et al. (2014). Hsp90 blockers inhibit adipocyte differentiation and fat mass accumulation. PLoS One. 9:e94127.